And here we are, in the new year. 2014 has such a nice ring to it, I am feeling this number, this is the year. I'm not sure for what yet, haha, but I am being positive. This fried rice is the first meal I cooked this year, and I used some leftovers for it. Something new and something old, good balance...you know? All joke on a side though, we had ham for New Year's Eve and we baked it with pineapple. I really love the combination of flavors and it was delicious. Even though we got the smallest ham, we still had most of it left after eating it for two meals, so I took most of it off the bone and started planning some meals. The bone with still some ham on will be used for a bean stew. I made several zip lock bags filled with slices of ham, some for sandwiches, some for frying with eggs. And then I chopped some up for our favorite, fried rice. That one ham would last us forever, so most of this I put into the freezer. After I finished all this we decided we would really like some fried rice so I got to work. This dish comes together in less then 5 minutes if you have leftovers from something or take out, but I didn't have it so I cooked my rice first. While it was cooking I prepared everything else and in no time we had a yummy dinner. Chris doesn't like rice, with the exception of fried rice, and he was very happy with this improvised version. I didn't have peas so I used edamame, and I really wanted to use some of the pineapple too, so I added that as well, it was delicious, if not very authentic. Start by cooking your rice. I've learned the hard way that 1:2 rice to water ration doesn't really work, the rice gets sticky and overcooked, so I use 1 to 1.5 ratio of rice to water. Do not salt the water either it you don't want rice to be sticky. I put the rice in the water with a little bit of canola oil and bring to a boil. When it starts boiling cover the pot and lower the heat all the way down. Cook for 18 minutes and then remove from the heat. Uncover the pot, put a clean dish towel over the pot and the lid back on top of the towel. The towel will soak up a lot of the moisture from the steam and it will help with the rice not getting sticky. After a few minutes remove the lid and the towel and fluff up the rice with a fork. While the rice is cooking in a wok or a deep dish pan heat up some canola and sesame oil and cook the carrots for a few minutes. Add minced garlic and ginger and cook for 30 seconds, constantly stirring and then add edamame, ham and pineapple. Add oyster sauce and soy sauce and turn off the heat. Take your two eggs and beat them with a fork or a whisk and cook them on a separate pan. I like to cook them a bit longer for fried rice then how I cook them for just eating them on their own. I like to see little chunks of eggs in the rice, rather then it getting all mixed up with everything and dissipating. Cut it up and set on a side. When rice is fluffed and ready add it to the wok, add the eggs and mix it all up. 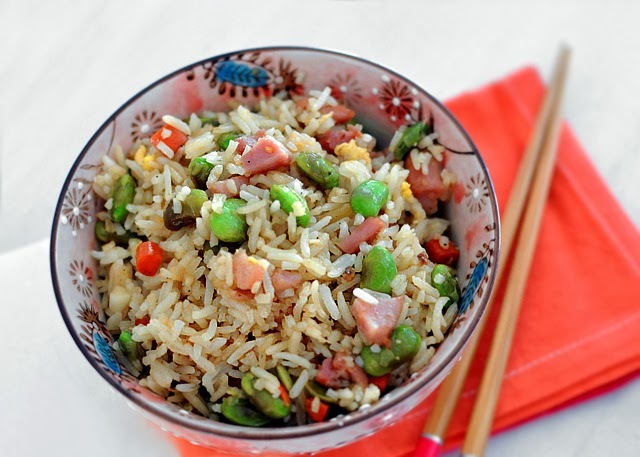 If you think you need some more soy sauce, you can add it at this point, but I like to start with less rather than making too soggy fried rice, we really don't like that. 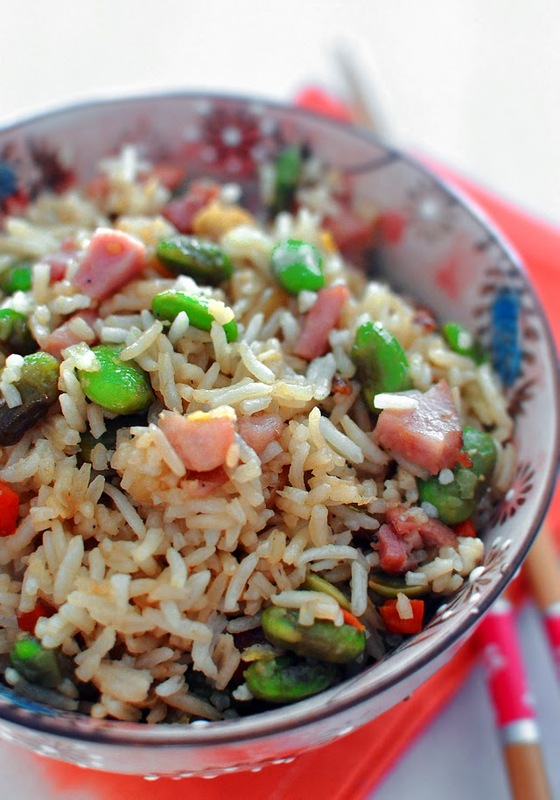 Serve the rice in bowls and if you want you can top it with some chopped green parts of spring onions.